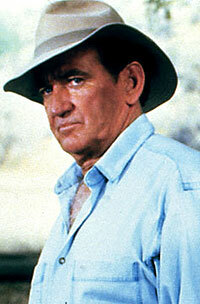 Rod Taylor played Frank Agretti on "Falcon Crest" during parts of its seventh, eighth and ninth seasons. So, how did Frank fit into the tangle of prime-time soap characters? Angela Gioberti Channing (Jane Wyman) lost her vineyard to Melissa Agretti Cumson (Ana-Alicia) by way of an ancient deed proving that it belonged to the Agretti family all along. But Melissa couldn't run Falcon Crest, had a breakdown, doused the house in gasoline and torched it. She died in the hospital, naming Frank Agretti's son, Nick (David Beecroft), executor of her estate. Nick ran Falcon Crest for a while, but Angela blackmailed it away from him. In the final season, outside forces and non-Channings took the vineyard away from Angela and her family. Angela spent much of the season in a coma following an attempted murder. Genele Ericson (Andrea Thompson) came to the Valley and began blackmailing and seducing Frank. He had helped Genele cover up the murder of Renee -- Genele's sister and Frank's former wife. (Got that?) Frank attempted to go to the police to tell of the murder, but he wound up being charged with the murder instead. Angela eventually awoke from her coma and regained control of Falcon Crest. In the series finale, during a lavish reception at Falcon Crest, Angela looked out at the vineyards, content in the happy news that, among other things, Frank soon would be released from prison. Rod seemed to enjoy his stint on "Falcon Crest." In an interview at the time, he said, "It's amazed the hell out of me that I've found so much on 'Falcon Crest' to sink my teeth into. We're doing some fine work on that show, and I'm getting a charge out of it like you wouldn't believe." Also at the time, there was speculation from CBS that Taylor's character would get an expanded "Lorne Greene-style Bonanza treatment," with Agretti and his sons setting up their own winery. Alas, that never came to be. "I still have a beautiful Native American jade crucifix that he gave me from Arizona. 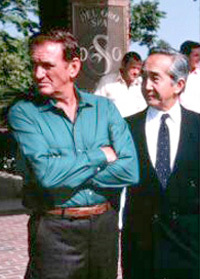 He was the one legend who was on the show who became a friend of mine. That would be the closest relationship that I had, but I really was just in awe of all of them." Long-lost Uncle Frank arrives on the scene, bearing secrets. His "only living relative," niece Melissa (Ana-Alicia), rejects him, but old friend Angela (Jane Wyman) welcomes him with open arms. Cool scene: Frank's fainting spell. Frank's secrets emerge as he reveals his plan. The good news: He has a treasure map that may lead to a fortune. The bad news: He's dying of pancreatic cancer and has only six months to two years to live. Frank and Melissa go searching for buried treasure in the ghost town of Hobart, Calif. Along the way, uncle and niece begin to bond. But after performing heroics to rescue Melissa, Frank gets conked by a loose beam, putting him in the hospital for several episodes. Cool scene: Snake shooting. Frank's still in a coma, recovering from his accident as well as surgery to cure him of his cancer. This episode just replays Frank's arrival at Falcon Crest. Frank recovers in fine soap opera fashion -- just in time to dash off to help Melissa and Lance (Lorenzo Lamas), who have been buried by a cave-in after discovering treasure: the deed to Falcon Crest goes to the Agretti family. Frank directs the rescue of Melissa and Lance. Then Melissa declares she's taking over Falcon Crest, turfing out Angela and the gang -- even Uncle Frank. The new season arrives with Melissa running Falcon Crest, but not well. We also learn that she may not be Frank's "only living relative" after all. Frank has a son! Angela tries to prod Frank into patching things up him. Cool scene: On the putting green. Angela has a forgery made of Melissa's deed, then pulls a switcheroo. Frank tries to reason with Melissa, but she's becoming increasingly irrational. Melissa completely wigs out, sets Falcon Crest on fire and dies. After the funeral, Frank meets up with long-lost son Nick (David Beecroft) and never-before-seen grandson Ben (Brandon Douglas) waiting for him. It's been 17 years since Frank and Nick have seen one another, and Nick's not happy about Frank's vagabond ways. Frank and grandson Ben begin to bond. At the reading of Melissa's will, Nick is named executor of her estate -- which of course still includes Falcon Crest. Despite his Agretti family ties, Frank insists that Falcon Crest belongs to Angela and demands that Nick turn it over to her. Nick is resentful as Frank expresses grief over missing Melissa. Ben is resentful of Nick for not telling him more about his mother. Angela goes looking for dirt on Nick so that she can blackmail him and get Falcon Crest back. Angela locates Ben's mother, and tells Nick she'll keep the secret for a price -- Falcon Crest. Nick signs Falcon Crest over to Angela. Frank tells him he did the right thing (but he doesn't know about the blackmail). Frank, Nick and Ben make a celebratory trip to San Francisco. Upon their return, Frank's old friend (and old flame?) Libby arrives on the scene, trying to lure Frank into going to Colombia to mine emeralds. Nick finally tells Ben about his mother. Frank is torn between staying with his son and grandson and going off with Libby to find a fortune in emeralds. Nick finally gets over his anger, and on Christmas Day, Frank departs. Cool scene: Nick saying to Frank, "She's an attractive woman, she's sleeping with you and she's dangling an emerald mine in front of you. Of course you're leaving!" After a several-episode absence, Frank returns because Ben has been in an accident. He also comes bearing emeralds for Angela and just in time to perform another cave-in rescue. This time it's Richard Channing (David Selby) and his young son, Michael, down an old well. Cool scene: Frank's reaction at meeting Ben's mother, Anna. Frank's on the periphery of this one, being of comfort to Ben, Nick and Anna -- who's dying. Meanwhile, Richard is recruiting the Melissa lookalike to trick Angela, who he has kidnapped while he swings a business deal. Lance, wondering where Angela is, looks in the safe for a clue. He, along with Frank, notice the safe contains three deeds to Falcon Crest. Lance later burns one. Angela is back, and Richard is making it seem as though she's crazy because of her claims that she was abducted and saw "Melissa." Meanwhile, Frank and Nick break into the bookstore and find the deed to Falcon Crest. A judge rules Angela is mentally disabled and awards conservatorship of Falcon Crest to her son Richard. But wait! Angela's attorney produces some new information, and the judge awards conservatorship to Angela's husband -- Frank Agretti. Frank and Angela explain that their marriage will be annulled when Falcon Crest is safe from Richard Channing. In the meantime, Angela and Samantha/Melissa plot against Richard and get him indicted for illegal trading. Rod's not in the first episode of the ninth season much, but he is in the credits for the first time as a regular cast member, rather than "special guest star." Frank is seen driving Angela to the airport; she is on her way to Greece. 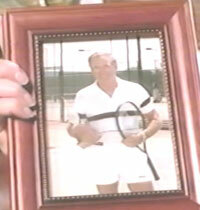 Frank mentions (for the first time ever) having been on the tennis circuit in his youth. This episode is directed by Reza Badiyi, who directed "Hell River." The weirdo Charley St. James enters the scene, as boyfriend to Emma, Angie's kooky daughter. Frank and the gang have gathered for Maggie's funeral. Charley later attempts to smother Angela with a pillow. Angela is in a coma from lack of oxygen to the brain. Charley disrupts the electricity at the hospital to knock out Angela's life support. The electricity is restored, but the doctor recommends pulling the plug. The decision is Frank's. Genele & Frank start the day heating up the sheets. Frank goes to court to sue for power over Falcon Crest. The power will go to either Lance, Frank or Richard. Frank has a public, drunken skirmish with Genele at a restaurant. Later, he has a nightmare about his dead wife, Renee (who was Genele's sister). Frank wakes up and drives to a wooded area, with a shovel. He goes into the woods, saying "Renee, be there..." Genele shows up and says she dug Renee up a long time ago. She tells Frank: "She's in a box and will stay there as long as you do what I say." Genele and Frank go to the hospital. Genele talks Frank into killing Angela so that he will get control of Falcon Crest. He goes to Angela's room with intent to kill, but he doesn't do it. Nephew Chris is in love with Sydney, who is a girlfriend of Ian, a degenerate buddy of Charley's. Then Chris vanishes. Later, Ian tries to strangle Sydney. Frank bursts through the window to rescue her. Sydney stabs Ian. Emma shoots Charley. 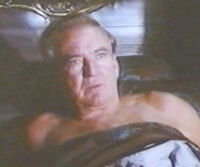 Genele (in bed with another man) forces Frank out of his own home. He goes to the police with the bones of his ex-wife and informs them that Genele killed her 10 years previously. But they arrest Frank, and he isn't seen again. In the series finale (Episode 9.22) we learn from Angela's closing voice-over that he'll soon be back at Falcon Crest. So far, only the first three seasons of Falcon Crest have been released on DVD.